So, I mentioned in my post on Thursday that Jennie and I were taking our five-going-on-six-years-old cousin, Anne Heaton, to go ice skating on Saturday. I think Jennie's obsession with Olympic Figure Skating (well, figure skating at any level, to be fair... she has been known to watch Skating With Celebrities) is what planted the original idea in her head. 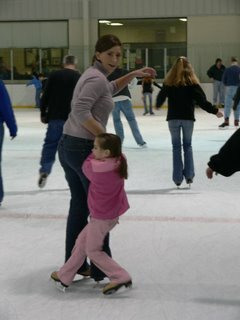 Mind you, we've both been skating before, but not since we were in elementary school, and who remembers much about anything from that era that doesn't involve Hello Kitty or New Kids on the Block? She wanted to see if its as easy as Michelle and Sasha make it look... and pick up a brochure about lessons. It's not like I had anything better to do with my Saturday, and I really wanted to be there in case she busted it on the ice, so I agreed. We go and pick up Anne Heaton from her grandmother and sing Disney songs the whole way to the skating rink. Jennie was worried about the crowds. My answer to her included something about it being too cold out, the Galleria (which we'd visited earlier in the day) looked to be where the crowds were today and besides, who goes ice skating on a random Saturday, especially when the Olympics are on? Well, apparently, everyone and his/her brother goes ice skating on a random Saturday. The church bus in the parking lot should have been our first clue. We walk in and are overwhelmed with the deafening noises and commotion you might expect from a mass of birthday-partying grade schoolers on a sugar high. We purchase the tickets and go stand in line to get our skates. 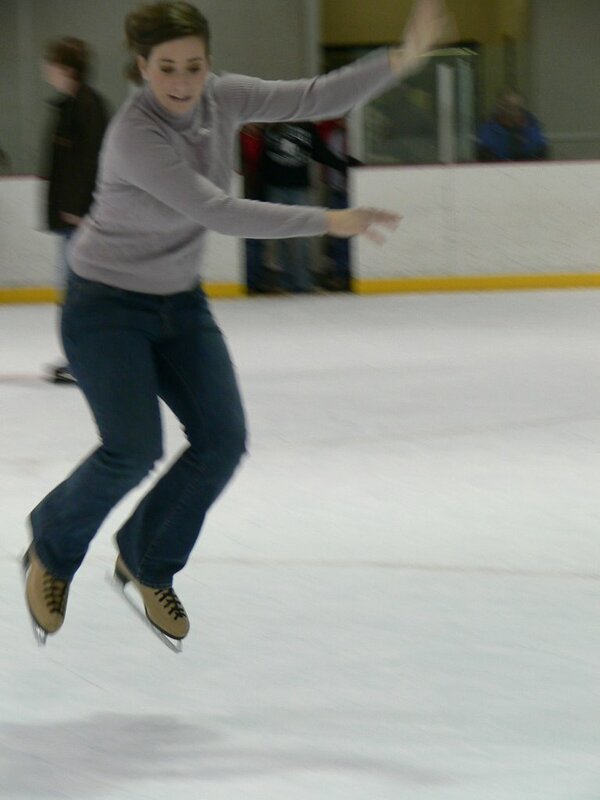 At this point, Anne Heaton is clutching my hand for fear of being swept away in the throngs of skate-clad children. We get our skates and head for the absolute corner of the building so we can find a spot to sit down and lace up. After all three of us are laced to the knees and ready for the ice, Jennie collects our stuff, which is neatly piled on the bench, to go and find a locker. Have you ever been to a skating rink/entertainment venue/place where there are a lot of people and there's NOT tiny lockers? If your answer is no, then come to Birmingham, where apparently, ice skaters don't need lockers. That's right. There's 4,234 parents and children crammed into what most people would call a warehouse and there's nowhere to safely put your valuables behind lock and key so that a recent Pelham High School graduate wearing a Letterman's jacket, bleached hair and a bad attitude couldn't take off with your wallet/camera. (For the record, we did ask a little old lady who was sitting comfortably on a bench if she wouldn't mind keeping an eye on our stuff, but she told us she was in charge of 60 kids and besides having to keep an eye on the ice, would be getting up soon. I realized after we walked off that rather than say "Thanks, anyway", what I should have said was "So you're the one to blame for this place being filled to fire-code capacity?" and kicked her in the shin with my toe-pick.) After asking aforementioned PHS graduate/proud employee of the skating arena to verify that there were in fact no lockers, we ended up stashing our shoes on top of a vending machine, and I was content to just skate with my purse on my shoulder. Jennie was not a supporter of this plan, however, so she changed her shoes and went and put our purses in her car. By this time, Anne Heaton was tired of "practicing" on the rubber mats, so she and I bravely wade through the throng of pre-teens that have just been summoned to Party Room B and step onto the ice. While holding Anne Heaton's hand and observing the general chaos that was speeding by me, I notice an interesting hierarchy of power on the ice. Apparently, the kids (or in a few sad cases, adults) who play on hockey teams or skate competitively--in other words, know what they're doing--like to don their game/competition gear and hit the ice on their off days to whiz by and silently taunt those of us who paid $8 to fall down. You would think they'd get their fill at practice. There was even one little girl who was actually wearing a black skirt, white tights and naturally, the perfect white ice skates that all of us asked Santa for at one point during our childhood. Not going to lie... I was a little jealous. Actually, this picture was right before her right foot went in between my skates and we both fell down. But the point is, you can see that none of her weight is being supported by anything below her armpits. Eventually we get her straightened up and we all skate merrily around the rink, just like Jennie had imagined. Anne Heaton was the one to notice what resembles a weight-lifting belt suspended from the ceiling and attached to what looks like a trapeze but is on a zipline cable. Obviously, this is the mechanism they use to teach the little skaters (or Jennie, once she takes the lessons she's considering joining) how to jump. Of course. I've actually wondered in my lifetime how they teach people to jump. Ice is not something I'd prefer to fall upon (though Anne Heaton left me no choice), so I don't think my career as an ice skater would have lasted past the lesson in which we start learning to twist and jump and leap off of it. My sister and I muse outloud about the logistics of it all, commenting how hard it must be to do more than go in an oval like we are, and **gasp** actually remove your skates from the ice. Of course, it should be noted that during competitions, or better yet, when you're NOT at a public rink, the ice is frequently Zambonied, the only elementary school students on the ice are the ones picking up your flowers, and the skaters are equipped with much higher quality skates than we are (and by higher quality, I mean lighter, with better blades, and not rented). Never one to be outdone, I shift Anne Heaton's clutch to my sister's hand, look both ways before crossing the ice (much like you do when crossing the street except that cars will stop, preteen skaters will not), and head to the middle of the ice which I now refer to as "the eye of the hurricane". I skate around for a second, and then, making sure I have both my sister's and cousin's attention, I complete my first jump. Jennie, Anne Heaton and I have great appreciation for my humor and attempt a few more scaled-down versions of the stunts we see the professionals do, including a lift and a spiral (click here for more pictures). A hour and a half and couple of more laps around the ice later, we all realize simultaneously that our feet are hurting and we're hungry. We take our last lap and bid the ice farewell. I guess our trip was successful, because Anne Heaton told me that for her birthday next month, she is going to ask for ice skating lessons. Let's hope they teach her to jump a little bit better than I can.